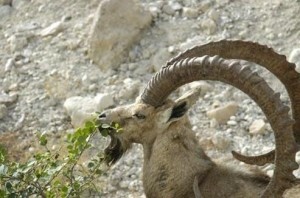 The Wild Goat Abraham Saw. 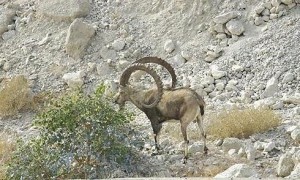 Connie and I were recently down by the Dead Sea and we spotted this Ibex (wild goat) not to far off the highway. We stopped and took this picture with a zoom lens. It occurred to me when I viewed the pictures that this is about what Abraham must have seen on Mount Moriah when he was getting ready to offer up Isaac. A wild goat in the bushes. This is most likely the same wild goat Abraham saw, the Ibex is native to this land and has been here for thousands of years. Hope you like your little trip to the dead see with us.